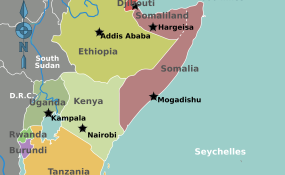 A map showing Kenya and Somalia. Colonial border lines met with fierce resistance. In Kenya the line delineating the Northern Frontier District produced an immediate reaction, sparking the Shifta War soon after Kenya's independence in 1963. The area is ethnographically dominated by Somalis. Kenya and Somalia are at loggerheads about the location of their maritime boundary. The claim that Kenya is making cuts off Somalia's claim. And Somalia's claim cuts off Kenya's claim. the razor's edge on which hang suspended the modern issues of war or peace." a slender thread of scientific civilisation ... drawn across the primeval chaos of the world. In fact imperial line drawing minted another kind of chaos. This chaos would pit Kenya's post-colonial state building against Somali's self-determination and identity politics while spreading tendentious seeds of division across the map of East Africa. Frontier fighting took hold in the Northern Frontier District, and has followed every kink and turn in the borderland, which now finds expression in a simmering dispute out into the sea. Kenya is looking for a way to avoid the Court's exercise of jurisdiction. A few weeks ago, Nairobi abruptly recalled its ambassador to Mogadishu and sent back the Somali ambassador. Kenya's claim: Somalia purportedly auctioned off shore oil blocks in the disputed sea region to European energy companies.